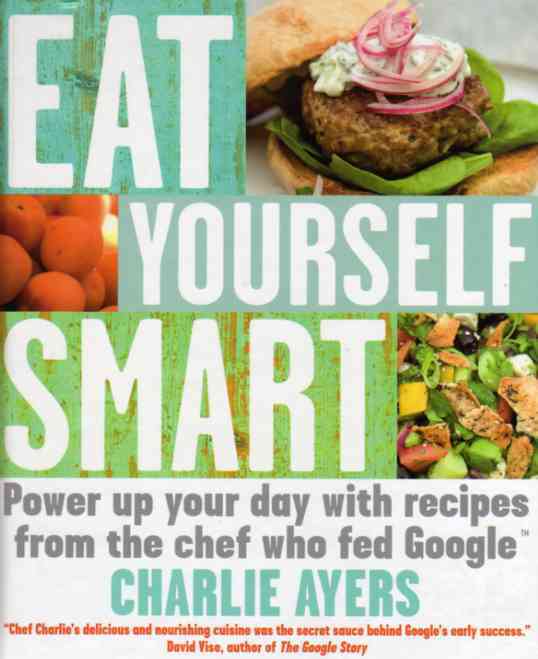 “Chef Charlie’s delicious nourishing cuisine was the secret sauce behind Google’s early success” says David Vise, author of The Google Story. Well, that set the scene for the book. It’s a very original concept and a very original cookbook. The first 100 or so pages have no recipes at all but concentrate on the culinary philosophy of chef Charlie Ayers. Perhaps it should have been called the Google Cookbook, as it is they who offered Charlie a free hand to develop his style of cuisine, with the specific intention of maximising employee brain-power and well-being. He wants people to eat better, fresher and healthier. Charlie Ayers was Google employee Number 53 but by the time he left the company in 2005 there were 5 sous chefs and 150 kitchen staff serving 4000 lunches and dinners each day. Now, that’s a big restaurant! It’s a very West Coast California book but Charlie’s ideas are solid and sensible and revolve around respect for your own body and the environment. He is dedicated to the organic food path because it’s logical to buy chemical-free foods because they are better for you, buy locally because it’s fresher and cheaper. He only buys fresh produce from a 150-mile radius. That’s probably easier for Charlie to sustain as he lives in California where you are only ever 100 yards away from an orange. But we should all be more aware of travel miles for our produce and buy from local sources where possible. There is a surprisingly large section devoted to larder ingredients. There are lists of vinegars, salts, oils (he has a recipe for cheese flavoured oil! ), grains, nuts and seeds etc. Then it’s on to the recipes…. I wasn’t expecting to like these but I was pleasantly surprised. Start your day with Black and Blue Yoghurt Fru Fru. A lovely concoction of Yoghurt, fruit, almonds and honey. Cranberry-Orange bread sounds lovely. How about Apple and Brie Quesadillas? Might have some Duck and Shrimp Dim Sum. Hey, this healthy eating isn’t as boring as I had supposed! I thought that it would be a struggle to write a positive review of this book but then I read it (always a good start for a reviewer) and warmed to the subject. Whilst it’s true that Charlie Ayers is passionate about raw/organic/local/fresh food, he is equally passionate about taste and balance. You will eat and enjoy his food because it’s delicious ….and by the way, it’s good for you!